Pantone® – the global color authority and provider of professional color standards for the design industries – has announced it Color of the Year for 2014. In the New Year, Emerald Green (PANTONE 17-5641) – Color of the Year 2013 – will make way for a delightful shade of purple dubbed Radiant Orchid (PANTONE 18-3224). Although Pantone serves a number of industries – such as fashion and beauty – we in the home design sector look forward to the company’s announcement of Color of the Year each December. Use of color is a major element of the work we do, and the focus on one particular color creates excitement and fosters inspiration. According to the Color of the Year announcement release, the selection process requires careful consideration and, to arrive at the selection, Pantone quite literally combs the world looking for color influences. This can include the entertainment industry and films that are in production, traveling art collections, hot new artists, popular travel destinations and other socio-economic conditions. Influences may also stem from technology, availability of new textures and effects that impact color, and even upcoming sports events that capture worldwide attention. At Highlight Homes, we welcome the opportunity to help you incorporate Radiant Orchid into your upcoming home renovation. 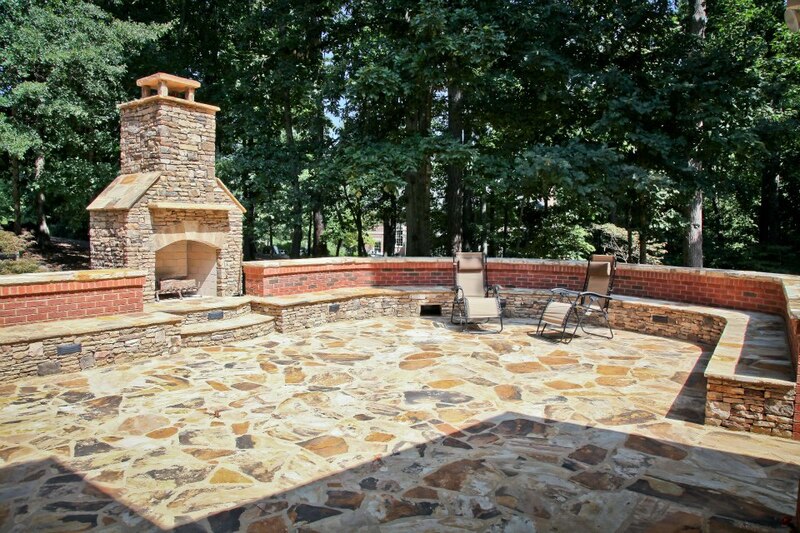 To schedule a no obligation consultation with our design-build team, call 678-873-9234, e-mail info@highlighthomesga.com, or fill out our convenient online contact form. 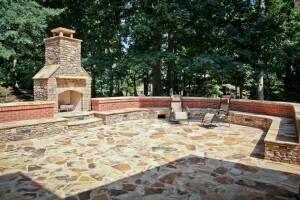 To learn more about Highlight Homes and the services we provide throughout the Metro Atlanta area, please visit us online at www.highlighthomesga.com. More information about Pantone and its 2014 Color of the Year is available at www.pantone.com. 1) Outdoor Living Rooms – From outdoor hearths and kitchens to cozy open air parlors, savvy homeowners opted to extend their living spaces to the exterior of the home in 2013. 2) Home Theaters and Media Rooms – This trend continues to remain hot as families gather together in their own personal movie theaters and mini-arcades. 3) Aging in Place Solutions – With more and more folks opting to make their current home a “forever” home, the number of age in place solutions incorporated to renovations has been on the rise. Chief among them have been bathroom modifications and master bedrooms on the main level. 4) Green Living – Energy efficiency, eco-friendly appliances and use of sustainable materials make this one of our favorite continuing trends. Highlight Homes always uses green construction practices on all of our renovations and custom home construction projects. 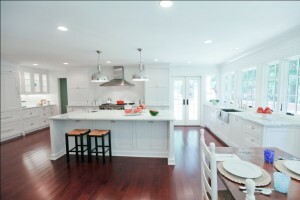 5) Kitchens with Islands and Glass Backsplashes – The kitchen island is LITERALLY central to trends in kitchen design. We can’t remember the last time we took part in a kitchen renovation that did NOT involve an island. They terrific for food prep, homework, entertaining, dining, storage and so much more! 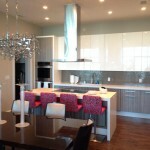 Glass backsplashes would have to run a close second to our favorite trends in kitchens for 2013. We love how they reflect light and add an undeniable sense of glamour to the space. 6) Transitional Style – This eclectic blend of traditional and contemporary design has really taken off, and serves as a perfect fit for our combined tastes here at Highlight Homes. The result is a timeless look that suits a wide variety of personalities. 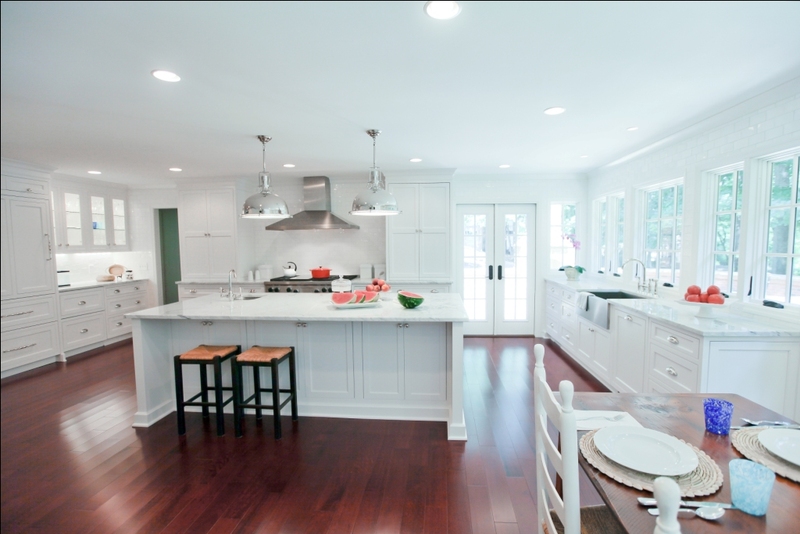 7) White Cabinetry – Crisp, clean and dreamy – we continue to be BIG FANS of this ongoing trend in kitchen renovations. 8) Dual Master Suites – This trend first entered our radar towards the end of 2012 and continues to maintain steam due to the number of friends who choose to cohabitate, adult children who move aging parents into the home, and spouses who opt to have a room of their own. 9) Open Floorplans – Long gone are tight cramped spaces! Homeowners today long to breathe free, and will often opt for the removal of walls and a shift in their original floorplan. 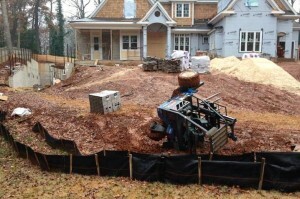 If you are considering a move like this in your own home, don’t grab a sledgehammer! Instead, seek the assistance of an expert who specializes in structural engineering so you don’t harm the integrity of your home’s construction. FYI – it just so happens that Highlight Homes specializes in structural engineering! 10) Unique Touches – One of our favorite aspects of any home renovation is that one element or design touch that makes a living space unique to the homeowner and their family. 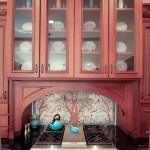 We once ordered a hand-painted “Tree of Life” tile mosaic from the oldest tile maker in Jerusalem – it completed the project beautifully and serves as a focal point for everyone who enters the kitchen where it hangs. 11) Sleek and Refined – This trend serves as a nod to old Hollywood glamour, and is particularly true of bathroom renovations. Where spa influences have been huge in recent years, a growing trend toward luxury and good old-fashioned glitz is slowly taking the lead. 12) Engineered and Hardwood Flooring – More and more homeowners are opting to step away from carpet in favor of hardwood or engineered flooring. They are easier to maintain, add a touch of luxury to any room, and can be visually enhanced with a beautiful area rug. 13) Pale Walls with Splashes of Color in Décor – The bulk of our renovations in recent months have called for pale hues on the walls with splashes of vibrant color in the décor. Soft greys reigned supreme throughout 2013, which worked beautifully with pops of red, purple, orange and turquoise. To be among the first to SET the trends for 2014, Highlight Homes invites you to contact us to schedule your no-obligation consultation. Our talented design-build team welcomes the chance to help you create living spaces that will renew your family’s love for your home, and potentially add to its allure and value to potential buyers when it comes time to sell. We can be reached by calling 678-873-9234 or e-mailing info@highlighthomesga.com. 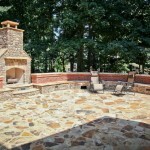 To learn more about Highlight Homes and the many services we offer, please visit us online at www.highlighthomesga.com.